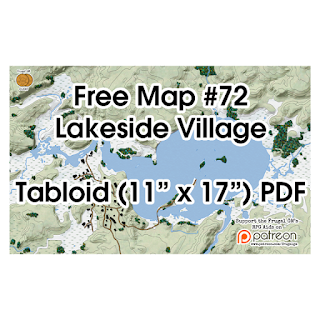 Free Map #72: Another Lake! I posted another freebie map on my Patreon page and pretty much forgot to post it yesterday. For someone who doesn't swim (much) and really doesn't fish or boat I have to say I love the water. The home I'm living in was chosen mostly because the back of my property line is the center-line of a year-round creek (quite uncommon here). When I'm making maps I start with an interesting water feature and work backwards from there. I had a particular area in mind for a Tweak & Toss adventure seed and I got about 1/2 way through making the map when I realized that I really wasn't going to be able to add the features I wanted, so I scrapped that map and started over again. On these style of maps I'd rather have it turn out the way I want even if it takes a fair bit of time. Anyway, this map was close enough to a specific paper size that I went ahead and cropped it to an inch under tabloid size so the finished map would have a 1/2" border all around. This map is more than just a lake, it is a small village by a lake. Some of the village is in the marshy wetlands around the lake and there is just one road in/out of town. Another road just winds up to a center-point of the lake. 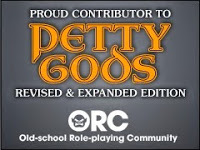 My Patrons' map is the same size but a better resolution (higher PDF production settings) and is layered, so certain features can be toggled off if desired. As a last-minute thing I reduced the resolution of my base file from 300 DPI to 100 DPI, but I tripled the size and saved it as a .PNG file so the GM could slice it up as desired for a VTT. 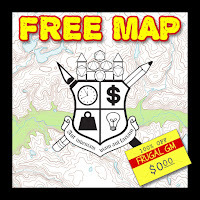 Like usual, click on either graphic to go to the map's download page, or use this link.